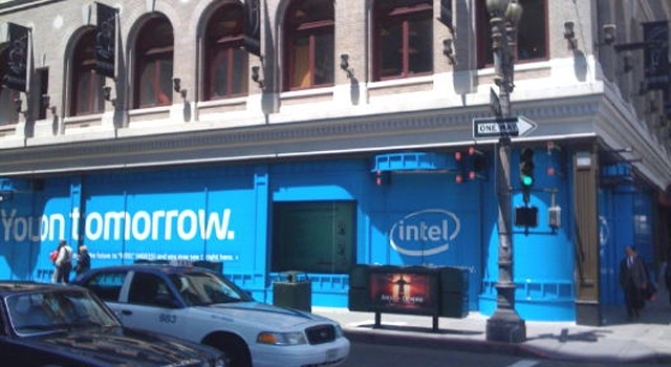 Intel has taken over where a Disney Store used to be in Union Square in San Francisco. This latest barrage of advertising is duly paid for, and even masks all the forlornness left behind by a broken Disney Store. The New York Times: "Taking advantage of all the abandoned retail spaces in urban areas, marketers are leasing them at cut-rate prices and filling them with their ads. At first, advertisers saw storefront advertising as a poor man’s billboard — that is, a bad thing. Now, they see it as a poor man’s billboard — that is, brilliantly frugal." Across New York, San Francisco, and Berkeley, ad agency BBDO is paying an average of 500 bucks a month for three-month stints, compared to $50K for a billboard. We hear a line on Frank Chu's sign goes for $150 a week.